Earlier today, you would have found me cross-legged on Elle’s bedroom floor, folding the top flaps of a box together with one hand, holding packing tape in the other. Sealing away for a few weeks some of the odds and ends that string together the life of an eight year old girl. As I ran the tape across the top of the box, I noticed familiar writing, the boxy all-caps print that belongs to my mother. Letters marched in formation, if a little smudged now, across the box. The box corners a bit battered, edges and middle seam thick with layers of wide tape. The top of it marked with our old Indiana address, at least five years and 1900 miles from here. Farther, it seems, and longer ago, back to a day and place when she would have mailed something to any of us. 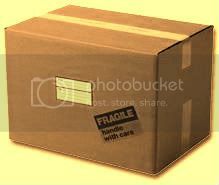 What I packed in that box was nothing of consequence, nothing poetic or symbolic, just the stuff of a life. I don’t remember what she sent to us in that box, just that since then, it’s been unsealed and sealed, opened and closed up again. Repeat. A metaphor for our relationship, if ever there was one. What I know – all I know – is that since we moved here, I’ve moved on from where I was when that box showed up at our door in Indiana, and from where I was, even, when I unpacked it here and folded the box flat again. Things changed, even more than they had already. Hard words flew across miles like arrows, found their mark. Others never left the quiet rooms where one or the other of us thought them, then thought better. In the end, we have the relationship that amounts to all we were ever going to have, with apologies to hope and good intentions. Disillusionment buys the drinks around here. Disillusionment and the ghosts that deliver it, sometimes in boxes. Yes, things can come back to haunt us. People, relationships, objects. But maybe they’re only scary if we believe in their power to harm us. Once that is gone, we’re free to turn away and carry on, startled maybe, but not shaken anymore. So if I sealed something into that box today (besides the small treasures of age eight) it’s that. The past is just the past again. What’s gone is still gone. And a box is just a box. Wow – this post is so different from posts past ! It’s such a great thing to be able to notice, and step over, the things that normally inflict pain. It’s becoming more of a pattern, I think. Blogging and music and processing are doing their work here . . . leaving you with a depth of expression that blows me away. You and I share a similar story in many ways and I knew exactly what you meant the whole way through this post. As a mother myself, it is difficult to understand how any mother could abandon a child although I do recognize there are times when it may be better for the child… at least temporarily. But when given a chance to make amends and begin again and they still choose to turn away…it’s time then for the final letting go. It came to me slowly in bits and pieces only taking giant leaps when I became a mother myself. My mother and her issues no longer hold the same power over me and memories that once caused such grief are now just memories and not the painful cord that once connected me to a woman who chose to cut our ties and move on. Thanks for sharing this today…. beautiful writing. strong woman. I haven’t moved around as much as you, but I found it hard to pack the last of my children’s things – the “important” stuff – and I would have been thrown by that box. I probably would have recycled it after the first move, actually. So beautiful! The idea that a container can be only a container–its contents holding the real story–and yet it has a story of its own. I love this post. Oh, if only we really could just seal up those parts of our past in a box, never letting any of it leak out (and as I just spent a complicated weekend with my complicated mother, I want this very much). But it’s not all bad, is it? The past, heinous hurts and all, that has made our present? I’m so glad you’re in a good place as you move to your new place. I would have scratched out the old writing with a strong Sharpie. i’ve been reflecting lately that it’s easier for those of us who move often to let go of the past. I think that often, the more time we have invested in our family of choice, the less power our family of birth has over us. I always want to leave a good comment but then you go and write something as beautiful as this and then where can I go? You said it perfectly. Beautiful writing, beautiful flow and tone. I like the closure in the end. Wow, that’s a box that has come full circle! I bet your daughter will view it quite differently. Which, I should add, is a tribute to how far YOU have come. She will look at the box and think of your tenderness, your love, your time, your understanding. Oh my, what a beautiful post. Growth is an amazing thing, isn’t it? Amazed that you saved it .. the only boxes that get saved at Casa Edelstein are those from Zappos, in case we need to send what came in it back .. and those get tossed once we’re sure we like ’em, they fit, they are keepers .. and the boxes electronics come in for the same reason PLUS Husband is a bit of a worrier . what if we need to send something in for repair .. original box is a good thing. I digress and seem to have done a post … vs a comment. I am glad you have forgotten what came in that box … letting go of the past is a good thing ..
Wow! Another amazing post, your writing, even when it is painful to read is beautiful and pulls you in! As stated earlier, it is great see you moving from a place of dealing with some issues to actually letting them go and moving on. The journey or life, thank you for sharing and inspiring others with your stories and writing. It moves from the I have been here, how do you deal with this, how hard do you work at trying to repair and when do you let go. Always looking forward to more! Yeah, sometimes moving is good for the soul in that it allows us to act out what we want to do so badly in our heads. You just put that into beautiful words. You always do. Wow. That’s a powerful piece of writing. A box is just a box. That sounds healing to me. I just love you and I already miss you. Sometimes I wonder if we were actually raised by the same mother. you just gave me shivers girl. what a beautiful piece of writing. And yep, this is why I love your blog. Such a great post. I really understand what you mean, having just moved myself – or rather, still in the middle of the move, since the only belongings we have with us now are those I packed in our luggage for the flight from NYC to Zurich. A box can be just a box, or it can be something else. To me, those boxes felt a little like black holes, the contents losing their meaning by being displaced, moved from the place where they belonged. I actually wrote a post about packing for the move too, just last week. Packing things up is definitely bittersweet. i don’t even know what to say. you know how much i want the past just to be the past again. But maybe they’re only scary if we believe in their power to harm us. Great line. The layers go ever deeper, don’t they? This is beautiful. Really, really beautiful. My mother passes a lot of books she reads to me, and sometimes when I read them and see the notes she’s scribbled in the margins, it makes me feel really close to her. She lives 10,000 km away from me! Over from David’s . . . Truly deserving ofthe POTD. This is a wonderful post. Glad I got to come by. Found you via David’s Authorblog so congratulations on winning POTD. Wonderful post; thought provoking and beautifully written. Would love to own some of those boxes myself. David sent me too-how lucky we are to have him in our corner. This is a beautiful post and resonates on so many levels. Mum is gone now and I have come to terms with our lives together. All I have of her is her spectacles and one scrap of her handwriting on a cookery book she gave me one Christmas. No tears for what might have been, what’s done is done, we both did our best and it was good enough. Now I try to be better than she was at motherhood. I’m glad you’ve sealed that box up. Such good writing and I can soooooooooo relate to this post. Putting the past in perspective and moving on to health and happiness is a choice. You are making a good choice. Over from David’s. Congratulations for winning POTD. I was trying to refrain from commenting here as I have the most wonderful memories of my mother, and I hope that when I am gone my kids will have ONLY good memories of their mom (me). That is why I failed to relate much with this post, but I just had to write this: you write beautifully!. it’s a masterpiece of words, emotions and almostic poetic content. Glad I came over. I am sorry your memories are’nt pleasant ones. But glad you are trying to move on. what a wonderful tale…sometimes those boxes are hard to seal and keep sealed, popping back up at the most interesting times…i am glad your box was resealed today. You are so right and it is so GOOD to feel that corner being turned. Sorry I haven’t been over in a while. I will come over from time to time but for now I am having to quit blogging. The last post is up and I just can’t find the time it demands of me. So I’m leaving it be for now. You, on the other hand, are gifted and should NEVER quit!